All gem-set TOWE objects are handicrafted in one of the worlds finest so called ‘haute joaillerie’ workshops in Geneva. The reason for not producing the TOWE jewels locally in Stockholm, but in Geneva, is that Towe Norlen’s jewellery design, breaking the rules of traditional high-end jewellery design, is exceedingly difficult to manufacture at the required level of perfection. It thus requires the top-most manufacturing expertise existing in the world today. This extreme level of craftsmanship is presently only available in a few unique workshops in Geneva and Paris, and nowhere else. 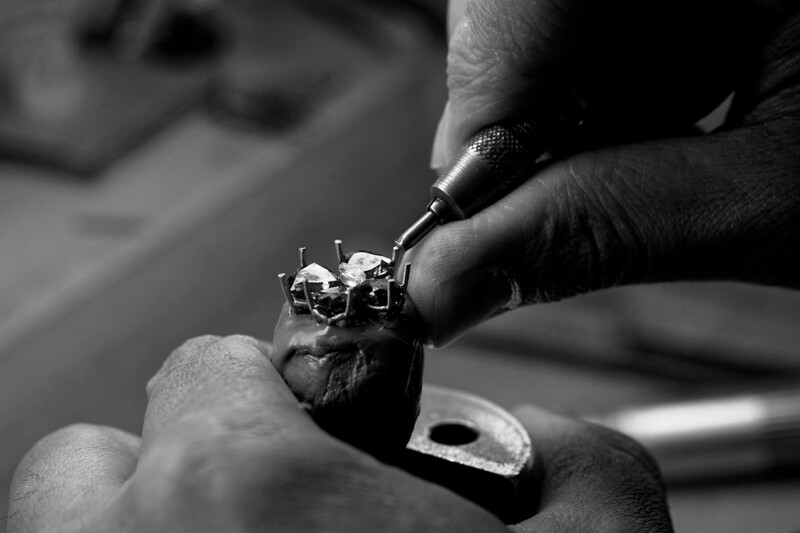 The manufacturing of a TOWE jewel often takes many hundreds of working hours and involves a number of highly specialised master craftsmen with different professional skills. Examples are ‘Le dessinateur’, or the draughtsman making a detailed drawing of the jewel; ‘La maquettiste’, or the model maker shaping a wax prototype of the jewel based on the technical drawing; ‘Le fondeur’, or the caster casting the jewel in gold from the wax prototype; ‘Le joaillier’, or the goldsmith/jeweller manufacturing the jewel from its different cast components; ‘Le diamantaire’ or ‘Le lapidaire’, the diamond- or coloured stone cutter; ‘Le sertisseur’, the stone setter; ‘Le graveur’ or ‘Le ciseleur’, the engraver or ciseler decorating the gold surface with engraving or ciselation techniques, and ‘La polisseuse’, or the polisher polishing the jewel until a flawless and durable gold surface finish is obtained.